Mercy Ships takes hospital ships to the world’s forgotten poor, bringing hope, healing and healthcare. The Mercy Ships volunteer crews relieve pain and suffering for thousands every year. Here you can find out more about what we do and why we do it. We invite you to join us on this journey either as a supporter, through donations or as a volunteer. An estimated ONE BILLION people lack access to even basic health care. They are plagued by preventable disease, untreated illnesses and neglected injuries. Even a simple toothache can become a life-threatening crisis. With the support and prayers of friends like you, we can say to the suffering men, women and children – Mercy is on its way! In many developing countries, even basic healthcare is out of reach. And in Africa, nearly 50 per cent of the people have no access to a hospital or doctor. Many nations in Africa are ranked by the United Nations Human Development Index as the least developed nations on earth, with only two doctors per 10,000 people. New Zealand has 10 times that ratio. A West African woman has a 1/16 chance of dying during pregnancy, it’s a 1/7150 risk in New Zealand. An estimated 70% of Africans live on less than NZ$2.25 each per day to meet all their needs; food, shelter, education and more. Why a ship – and why us? As 50% of the world’s population lives within 160km of the ocean, taking the world’s largest civilian hospital ship directly to the point of need, to people who would otherwise go without care, is a logical strategy to alleviating human suffering. 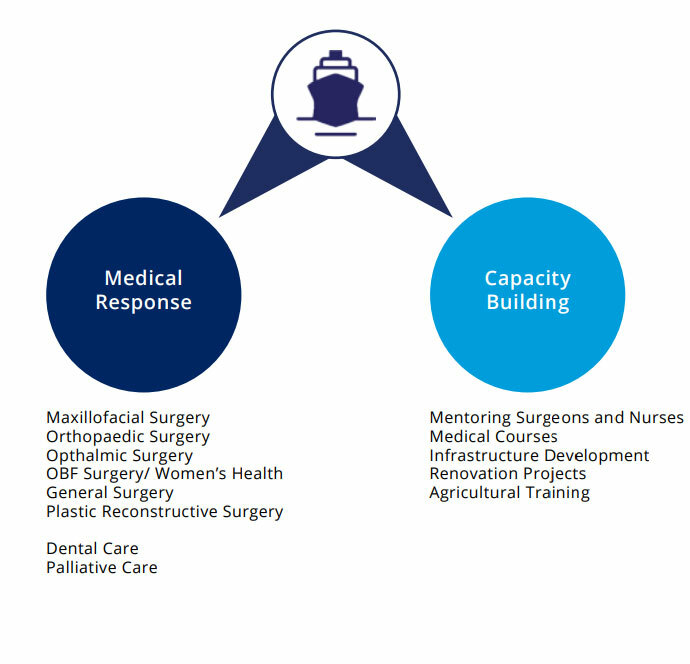 Taking a state-of-the-art, fully equipped and staffed, self-sufficient hospital into areas of extreme poverty means we can provide first class medical care in the midst of desperate conditions. In the poorest parts of Africa, children suffer and die from treatable causes. Mercy Ships sails into these regions to provide first-rate medical care that saves lives. Our volunteer medical teams remove tumours, give sight to the blind, correct clefts, straighten crooked limbs and more. Over 95,000 free surgeries have been performed for people in poverty since 1978. Guinea is around the same size as New Zealand, with a population of more than 13 million people. The average annual income is only $1,970 a year, and this struggling nation’s people can only expect to live to the age of 60 years. At 175/188, Guinea is ranked one of the lowest in the world on the United Nations Human Development Index which measures the quality of life. In August of each year, Mercy Ships begins a new field service in an African nation. For 10 months the hospital ship is docked in Conakry, Guinea in West Africa where thousands of patients who have been screened for surgery arrive for their free, life-changing operations. From August 2017 – June 2018, Mercy Ships undertook a field service in Cameroon for the first time. Located in West Africa, Cameroon shares its western border with Nigeria and is one of the world’s poorest countries. Cameroon has a population of 23.44 million living in a country about the length of New Zealand but much wider – with more than three times the population density. This French-speaking nation struggles with the effects of extreme poverty as indicated by the UN Human Development Index rating of 153/ 188 nations. These are some of the people whose lives were transformed.